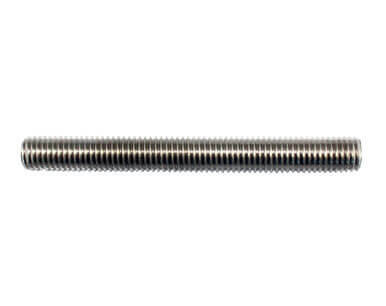 Asiad Steels is one of the popular exporters, stockist and suppliers of Titanium Gr.5 Stud bolt. The strength and ductility are similar of Titanium Gr.5 Threaded Rods, but the fracture toughness of the ELI grade is about 25% higher than the standard grade. While Titanium Gr.5 Threaded Bars is suitable for most applications, if higher fatigue performance is required the microstructure can be improved to increase the fatigue performance in excess of 90 ksi (RBF). Titanium Gr.5 Tie Rods enhanced performance is equivalent to forged or wrought material and allows Titanium Injection molding to be used in load bearing or fatigue sensitive applications such as orthopaedic implants or aerospace fasteners. The combination of these good mechanical properties in Titanium Gr.5 Tie Bars (maintained up to 400°C), a low density of 4.42 g/cm3 and a very good corrosion resistance. The welding ability of Titanium Gr.5 Double Ended Studs is good in normal conditions. When welding is sure to use inert gas shielding and post weld thermal processing is recommended. When performing fusion welding we also recommend using weld filler. 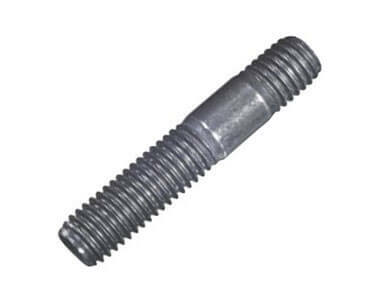 Grade 5 Titanium Stud Bolts generally has excellent resistance to corrosion, although, the alloy is sometimes susceptible to hot salt stress corrosion cracking. When performing precipitation hardening in Grade 5 Titanium Threaded Rods, one may use solution treatment and aging (STA) for a wide range of strength levels and ductility. Our standard Grade 5 Titanium Tie Barsdelivers fatigue performance in excess of 70 ksi (RBF). 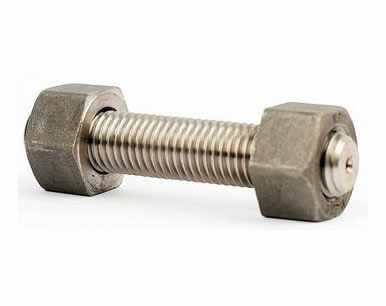 Buy Titanium Grade 5 Stud bolt at reasonable rates from us. We are Exporter of Ti Alloy Grade 5 Studbolt in Worldwide Such as India, Poland, Chile, Ghana, Romania, Belgium, Ukraine, Colombia, Belarus, Iran, Hungary, Kuwait, South Africa, Ecuador, Italy, Mongolia, France, Indonesia, Slovakia, Finland, Egypt, Philippines, Nepal, Spain, Mexico, Iraq, Peru, India, Azerbaijan, Bhutan, Portugal, Macau, Libya, Israel, Oman, Argentina, Chile, Taiwan, Japan, Bolivia, Greece, Lebanon, Nigeria, Hong Kong, Serbia, Estonia, Kenya, Netherlands, Gambia, Yemen, Kazakhstan, Germany, Mexico, Canada, Costa Rica, United States, Croatia, Austria, Pakistan, United Arab Emirates, Saudi Arabia, South Korea, Vietnam, Malaysia, Zimbabwe, United Kingdom, Namibia, Switzerland, Afghanistan, Trinidad & Tobago,Tunisia, Turkey, Singapore, Angola, Poland, Iran, Bangladesh, Denmark, Bulgaria, Czech Republic, Bahrain, China, Norway, New Zealand, Australia, Brazil, Venezuela, Thailand, Nigeria, Morocco, Russia, Sweden, Algeria, Gabon, Sri Lanka, Ireland, Tibet, Jordan, Puerto Rico, Lithuania, Qatar. We are Suppliers of Titanium Gr 5 Stud bolt in India Such as Mumbai, Haryana, Visakhapatnam, Edmonton, Karachi, Nashik, Caracas, Dammam, Istanbul, La Victoria, Hanoi, Muscat, Ahvaz, Brisbane, Jeddah, Kuwait City, Dubai, Ranchi, Manama, Noida, Mexico City, Howrah, Sydney, Dallas, Bogota, Al Khobar, Ludhiana, Colombo, Navi Mumbai, Rio de Janeiro, Jaipur, Coimbatore, New Delhi, Pune, Secunderabad, Gimhae-si, Montreal, Houston, Geoje-si, Granada, Indore, Tehran, Atyrau, Cairo, Port-of-Spain, Jamshedpur, Calgary, Surat, Aberdeen, Algiers, Mumbai, Bangkok, Courbevoie, Baroda, Vadodara, Chennai, Busan, Madrid, Rajkot, Ankara, Ho Chi Minh City, Gurgaon, Abu Dhabi, Sharjah, Moscow, London, Kuala Lumpur, Ahmedabad, Seoul, Petaling Jaya, Vung Tau, Perth, Nagpur, Kolkata, Thane, Faridabad, Al Jubail, Lahore, Melbourne, Jakarta, Bhopal, Los Angeles, Ernakulam, Kanpur, Santiago, Chandigarh, Singapore, Milan, Thiruvananthapuram, Doha, Lagos, Ulsan, Chiyoda, Hyderabad, Hong Kong, Riyadh, Bengaluru, Toronto, New York, Pimpri-Chinchwad.